This data set contains forest canopy scan data from the Echidna® Validation Instrument (EVI) and field measurements data from three campaigns conducted in the United States: 2007 New England Campaign; 2008 Sierra National Forest Campaign; and 2009 New England Campaign. The New England field sites were located in Harvard Forest (Massachusetts), Howland Research Forest (Maine), and the Bartlett Experimental Forest (New Hampshire). The objective of the research was to evaluate the ability of the EVI ground-based, scanning near-infrared lidar to retrieve stem diameter, stem count density, stand height, leaf area index, foliage profile, foliage area volume density, and other useful forest structural parameters rapidly and accurately. The EVI scan data are Andrieu Transpose (AT) Projection images in ENVI *.img and *.hdr file pairs. There are 28 images from the 2007 New England Campaign, 40 images from the 2008 Sierra National Forest Campaign, and 54 images from the 2009 New England Campaign. There are range-weighted mean preview image files (.jpg format) for each AT Projection image. Manual measurements of tree structural properties were made during each campaign at EVI scan locations. The field measurements are provided in one file for each campaign (.csv format). Parameters include species identification, DBH, tree height, crown base, etc. organized by field plot. There is also a data file (.csv format) which compares EVI derived measurements to the field measured data (DBH, stem density, basal area, biomass, and LAI) from the 2007 New England Campaign (Yao et al., 2011 and Zhao et al., 2011). The objective of this research was to prove the ability of a ground-based, scanning near-infrared lidar, the Echidna® Validation Instrument (EVI), to retrieve stem diameter, stem count density, stand height, leaf area index, foliage profile, foliage area volume density, and other useful forest structural parameters rapidly and accurately. The Echidna® instrument, built by CSIRO Australia, directs a horizontal 1,064 nm laser beam with 5 mr divergence and a pulse rate of 2 kHz to a rotating mirror at 45° incidence to scan a vertical circle, recording data from +137° to –130° zenith angles and all azimuths as the instrument revolves 180° on a tripod mount. The return signal is sampled at 2 gigasamples per second, digitizing the full scattered waveform. The shape of the return pulse distinguishes readily between hard targets (tree boles, branches) and soft targets (leaves). To test the ability of the EVI ground-based lidar to retrieve forest structural parameters, lidar scans and manual tree measurements were acquired in 2007 and 2009 at three classic New England locations: Harvard Forest, Petersham, Massachusetts; Howland Research Forest, Howland, Maine; and Bartlett Experimental Forest, Bartlett, New Hampshire. Another field campaign was conducted in 2008 in the Sierra National Forest, California. This data set provides the results from these campaigns, both the scan imagery and the field measurements. This data set contains forest canopy scan data from the Echidna® Validation Instrument (EVI), field measurement data from the three campaigns, and a comparison of EVI derived measurements to the field measured data from the 2007 New England Campaign. 54 AT Projection image files from the 2009 New England Campaign. There are range-weighted mean image files (.jpg format) for each AT Projection image. See tables below of field campaign locations for preview image links. Field measurement data of tree structural properties collected during each campaign at EVI scan locations. The field measurement files (.csv format) contain species identification, DBH, tree height, crown base, etc. organized by field plot and subplot. Comparison of EVI derived measurements to the field measurements from the 2007 New England Campaign. Compilation of 2007 New England Campaign EVI derived plot biometric data and field measurement plot data. Data file (.csv format) with compiled EVI derived measurements and the field measured data (DBH, stem density,basal area, biomass, and LAI) for the 2007 New England Campaign sites. Summary data tables with statistical comparisons of EVI derived data and field measurements. The New England campaign field sites were located in Harvard Forest (Massachusetts), Howland Research Forest (Maine), and Bartlett Experimental Forest (New Hampshire). There were two field plots in each forest for a total of six plots per campaign (2007 and 2009). Two of the plots were studied in both campaign years [Harvard Forest Hemlock site (HF_HH) and Howland Forest BU Shelterwood site (HOW8)]. The New England site locations are shown in Tables 1 and 3 below. The GPS locations may not match to each other from 2007 to 2009 due to the GPS accuracy. For these sites, the 2009 GPS locations should be the most accurate. The number of subplots varied per location and campaign (See Tables 5, 8, and 10). Table 4 is a cross reference for the various Plot IDs used for the New England sites. The California campaign field sites were located in the Sierra National Forest. There are eight forest plots in this campaign (2008). Site locations are shown in Table 2 below. * The Harvard Forest Plot 02 in 2007 was revisited in 2009 and designated "HF_HH". ** The Howland Research Forest Plot 01 was revisited in 2009 and designated "HOW8". *** The GPS locations may not match to each other from 2007 to 2009 due to the GPS accuracy. For revisited sites, the 2009 GPS locations should be the most accurate. *The GPS locations may not match to each other from 2007 to 2009 due to the GPS accuracy. For revisited sites, the 2009 GPS locations should be the most accurate. ** 2009 plots samples in 2007. Table 4. New England Sites Plot ID cross reference table. Note that Plot IDs changed from 2007 to 2009 and only two 2007 plots were revisited in 2009. Also note that the 2009 plots are included in the related data set, NACP New England and Sierra National Forests Biophysical Measurements: 2008-2010, and slightly different Plot IDs were used. Harvard Forest is an ecological research area of 1,200 ha owned and managed by Harvard University and located in Petersham, Massachusetts. The property, in operation since 1907, includes one of North America's oldest managed forests, educational, and research facilities. The forest stands are in the transition hardwoods - white pine - hemlock zone and are comprised mainly of red oak (Quercus rubra), red maple (Acer rubrum), yellow birch (Betula allleghaniensis), white birch (B. papyrifera), black birch (B. lenta), beech (Fagus grandifolia), white pine (Pinus strobus), and eastern hemlock (Tsuga canadensis). The study plots are located in the Prospect Hill tract. The soils are mainly sandy loam glacial till and are moderately to well drained. The climate is cool, moist temperate. July mean temperature is 20 C and January mean temperature -7 C. The annual mean precipitation of 1,066 mm is distributed fairly evenly throughout the year. Harvard Forest Website: http://HarvardForest.fas.harvard.edu/. Howland Research Forest is a 558 acre tract of mature, lowland evergreen forest located in central Maine, about 35 miles north of Bangor. The natural stands in this boreal-northern hardwood transitional forest consist of hemlock-spruce-fir, aspen-birch, and hemlock-hardwood mixtures ranging in age from 45 to 130 years. Dominant species composition includes red spruce (Picea rubens), eastern hemlock (Tsuga canadensis ), balsam fir (Abies balsamea), white pine (Pinus strobus), and northern white cedar (Thuja occidentalis). The land was designated as research forest in 1986 by the former owner, International Paper, and was purchased by Northeast Wilderness Trust in 2007, protecting the forest from any future logging activities. The terrain is flat to gently rolling with a maximum elevation of less than 68 m. Soils throughout the forest are glacial tills, acid in reaction, with low fertility and high organic composition. The climate is temperate continental. Howland Research Forest Website: http://HowlandForest.org/. Bartlett Experimental Forest is a 1,052 ha tract within the U.S. Forest Service, White Mountain National Forest in New Hampshire. Research activities began at the Experimental Forest when it was established in 1931. Bartlett Experimental Forest extends from the village of Bartlett in the Saco River valley at 210 m to about 915 m at its upper reaches. The terrain is rolling to mountainous; aspects across the forest are primarily north and east. The primary forest cover is the sugar maple-beech-yellow birch association. The upper elevations support stands of spruce and fir. There are areas of old-growth northern hardwoods with beech (Fagus grandifolia), yellow birch (Betula allleghaniensis), sugar maple (Acer saccharum), and eastern hemlock (Tsuga canadensis) being the dominant species. Even-aged stands of red maple (Acer rubrum), paper birch (Betula papyrifera), and aspen (Populus tremuloides) occupy sites that were once cleared. Red spruce (Picea rubens) stands cover the highest slopes. Eastern white pine (Pinus strobus) is confined to the lowest elevations. The soils at the Bartlett Experimental Forest are spodosols, developed on glacial till derived from granite and gneiss. The soils are moist but, for the most part, well drained. The climate in the Bartlett area includes warm summers and cold winters with mean January temperatures of 9.8 C and mean July temperatures of 19.8 C. Mean annual precipitation is 1,300 mm, distributed throughout the year. Bartlett Experimental Forest Website: http://www.fs.fed.us/ne/durham/4155/bartlett.htm. Sierra National Forest encompasses more than 24,000 km2 between 274 m and 4,263 m in elevation on the western slope of the central Sierra Nevada in the state of California. The forest was placed under U.S. Forest Service protection and management in 1893. Distributions of species are largely governed by climate, which is strongly dependent on altitude. The biotic zones include the foothill woodland zone from 300 to 910 m (interior live oak), the lower montane zone from 910 to 2,100 m (yellow pine), the upper montane zone from 2,100 to 2,700 m (lodgepole pine/red fir), the subalpine zone from 2,700 to 2,900 m (whitebark pine), and the alpine zone from 2,900 m (above the tree line). In addition, some 1,550 km2 of the forest are old growth, containing lodgepole pine (Pinus contorta) and red fir (Abies magnifica). Sierra National Forest Website: http://fs.usda.gov/sierra. 2007 New England Campaign Lidar scans and manual tree measurements were made at six New England forest plots, two plots at each location: Harvard Forest (Massachusetts), Howland Research Forest (Maine), and Bartlett Experimental Forest (New Hampshire) (Table 1). Each plot was 100 x 100 m square (1 ha) in size. 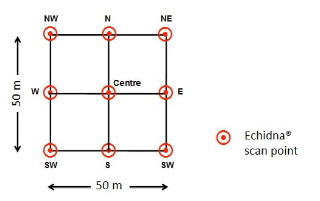 The Echidna Validation Instrument was used to scan the center point of the square and center points of four 50 m x 50 m squares nested within the plot for a total of five scans at each site (except at Howland Research Forest Plot 2 where only three scans were made) (Table 4). Placements of the instrument were sometimes shifted by a few meters in order to avoid larger, nearby trunks or shrub crowns. Manual measurements of trees were made in circular plots around the scan point of 20 m range (or 25 m at Harv_01 site). Figure 2. Plot layout in 2007 New England field work. At each one-hectare site, we acquired five ground-based lidar scans at the approximate locations shown. Circles of 20-m radius show the areas around the scan points in which stems were mapped and measured as described within the text. 2008 Sierra National Forest Campaign Lidar scans and manual tree measurements were made at eight Sierra National Forest locations (Table 2). Each plot was 100 x 100 m square (1 ha) in size, with 9 subplots in each plot (Figure 3). Manual tree measurements were made in each subplot. Figure 3. 2008 Sierra National Forest Campaign plot layout. 2009 New England Campaign Lidar scans and manual tree measurements were made at six New England forest plots, two plots at each location: Harvard Forest (Massachusetts), Howland Research Forest (Maine), and Bartlett Experimental Forest (New Hampshire) (Table 3). Each plot was 50 m x 50 m square, with four 25 x 25 m intensive subplots grouped together in center of the plot. Echidna® scans were made in the four corners of each plot (NW, NE, SW, and SE), in the center (C), and at N, E, S, and W locations (Figure 4A). 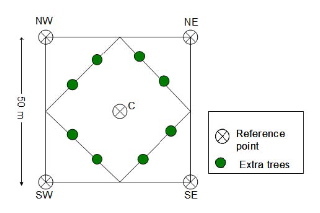 To collect the manual tree measurements, each 50 m x 50 m plot was divided into 5 subplots (C, NW, NE, SW and SE) (Figure 4B). The central subplot was a square plot, measuring 28.53 m by 28.53 m; the other subplots were isosceles right triangle plots, with 25 m right-angle side. The numbers of stems, with DBH < 10 cm and >3 cm, were counted within a 10 m distance of the reference point in each subplot (Figure 5). Figure 4.2009 New England Campaign (A) plot layout and Echidna® locations and (B) subplots for manual tree measurements around reference point. The "extra trees" were selected in order to register the entire stem plot map based on 13 different reference points. Figure 5. 2009 New England Campaign small-stem 10-m radius sample subplots. Measurements were made once at the subplots listed in Tables 4-14. Data file access: http://daac.ornl.gov/daacdata/nacp/echidna/data/ Images are ENVI .img and .hdr file pairs. Compressed files range in size from 50 - 200 MB. Image files, uncompressed, range from 1.5 - 2.5 GB. Table 5. 2007 New England Campaign dates and locations of EVI scans and field measurements. Scan image file names and links to Preview images are included. Plot level field measurements data are provided in a single ASCII file in comma-separated-value (.csv) format: ne_2007_forest_field_data.csv. Table 6. Column headings in the field measurement file for the 2007 New England Campaign. Subplot_ID Char none none none NW, NE, CP, SW, SE, NN and SS are abbreviation for northwest, northeast, central, southwest, southeast, north and south subplot in each plot. Tree_no Integer none none none The ID number of the tree in each subplot. Species Char none none none Common name of living tree species. DBH Float cm 1 -9999 Diameter Breast Height. Distance Float meter 1 -9999 The distance of the tree from the reference point of the subplot. In this data set, the reference point is the center of the subplot. Bearing1 Float decimal degrees 1 -9999 The bearing of the tree from the reference point of the subplot. In this data set, the reference point is the center of the subplot. Tree_height Float meter 1 -9999 The height from ground to the top of the tree. Crown_base Float meter 1 -9999 The height from ground to the bottom of the tree crown. OCCL Char none none none The tree is tallied as visible (V), partly occluded (P) or fully occluded(O) from the plot center. CR_P Char none none none Crown position of the tree, such as dominant (D), co-dominant (C),intermediate (I), suppressed (S), or dead (Dead). Radius1 Float meter 3 -9999 The crown radius in one direction. Radius2 Float meter 3 -9999 The crown radius in the direction perpendicular to previous one (Radius1). Notes Char none none none The notes were made if the tallied tree is also in other plots, or if the tree has some special properties. For example, the note “Bart_01_NE-30” associated with data for Bart_01 CP tree number 19 means that Bart_01 NE tree number 30 and Bart_01 CP tree number 19 are the same tree. Note: 1Bearing is relative to magnetic north. It is the bearing of the tree from the reference point in the plot. Table 8. 2008 Sierra National Forest Campaign locations of EVI scans. Scan image file names and links to Preview images are included. Plot level field measurements data are provided in a single ASCII file in comma-separated-value (.csv) format: sierra_2008_forest_field_data.csv. Table 9. Column headings in field measurements file for 2008 Sierra National Forest Campaign. Site Char none none none Name of site. Plot_ID Char none none none There are eight plots totally with the name of number: 23, 99, 168, 301, 305, 338, 406, 801. Subplot_ID Char none none none There are 9 subplots within each plot identified with numbers from 1 to 9. Figure 1 shows the locations of the subplots. Species1 Char none none none Tree species code. The code “none” indicates that the tree was not identified to species. See Table 18. Status Char none none none L means the tree is live, and D means the tree is dead. Distance Float meter 1 -9999 The distance from the front of the tree to the reference point in the plot. Bearing2 Float degrees 1 -9999 The bearing of the tree from the reference point in the plot. Crown_along_slope Float meter 1 -9999 The crown diameter along the slope direction. Crown_across_slope Float meter 1 -9999 The crown diameter across the slope direction. Crown_form Char none none none The shape of the crown. Notes Char none none none Thenotes were made if the tree has some special properties. Notes: 1The code list for the parameter species. The species codes are derived from the USDA NRCS PLANTS Database at http://plants.usda.gov/. The complete list is available for download at http://plants.usda.gov/dl_all.html. 2Bearing is relative to magnetic north. It is the bearing of the tree from the reference point in the plot. Table 10. 2009 New England Campaign dates and locations of EVI scans and field measurements. Scan image file names and links to Preview images are included. Plot level field measurement data are provided in a single ASCII file in comma-separated-value (.csv) format: ne_2009_forest_field_data.csv. Bartlett Forest site is in NH. BF_NACP is Bartlett Forest Tower site. Subplot_ID Char None None NA Each plot is divided into 5 subplots based on different reference point: C, NW, NE, SW and SE (Figure 2). Tree_no Integer None 1 -9999 The number of the tree in each subplot. Species1 Char None None NA Tree species for each tree. Status Char None None NA The tree is live (L) or dead (D). Distance Float meter 1 -9999 The distance of the tree from the reference point of the subplot. Bearing2 Float decimal degree 1 -9999 The bearing of the tree from the reference point of the subplot. Tree_height Float meter 1 -9999 Tree height, height to crown base and crown dimensions (the longest axis and the perpendicular one), were measured on every tenth tree. Crown_base Float meter 1 -9999 The height from the ground to the base of live tree crown. Crown_diameter_max Float meter 2 -9999 The max crown diameter. Crown_diameter_cross Float meter 2 -9999 The crown diameter in the cross direction. Cross-ref_distance3 Float meter 1 -9999 The distance from the central reference point to “extra” trees in the subplot NW/NE/SW/SE (Figure 2).See Methods Section for explanation. Cross-ref_bearing3 Float decimal degree 1 -9999 The bearing from the central reference point to “extra” trees in the subplot NW/NE/SW/SE (Figure 2). See Methods Section for explanation. Tables 13, 14, and 15 contain various summary statistics of comparitive analyses of manual field measurements of forest canopy parameters to those derived from the Echidna scan data. Source: Yao et al., 2011. Table 12. Column headings in comparative analyses data file for 2007 New England Campaign. SUBPLOT_ID Char none none NW, NE, CP, SW, SE, NN and SS are abbreviation for northwest, northeast,central, southwest, southeast, north and south subplot in each plot. ALL means the entire plot. EVI_LAI_REGRE Float m2/m2 2 One sided green leaf area per unit ground area in broadleaf canopies, or as the projected needle leaf area per unit ground area in needle canopies from EVI data. It's calculated by a simple regression method. EVI_LAI_HINGE Float m2/m2 2 One sided green leaf area per unit ground area in broadleaf canopies, or as the projected needle leaf area per unit ground area in needle canopies from EVI data. It's calculated by "hinge angle" method. Sample of results file for comparative analyses file for 2007 New England Campaign. Notes: 1Data are averages for 5 scans or plots at each site arranged at the corners and center of a square 50 m x 50 m.
2Standard deviations are based on values for these 5 scans. 3Destructive sampling (Catovsky and Bazzaz, 2000). 5J. T. Lee, University of Maine (pers. comm.). 6A. Richardson, University of New Hampshire (pers. comm.). The objective of this research was to prove the ability of a ground-based, scanning near-infrared lidar, the Echidna® Validation Instrument (EVI), to retrieve stem diameter, stem count density, stand height, leaf area index, foliage profile, foliage area volume density, and other useful forest structural parameters rapidly and accurately. See instrument description below and Yao et al. 2011. 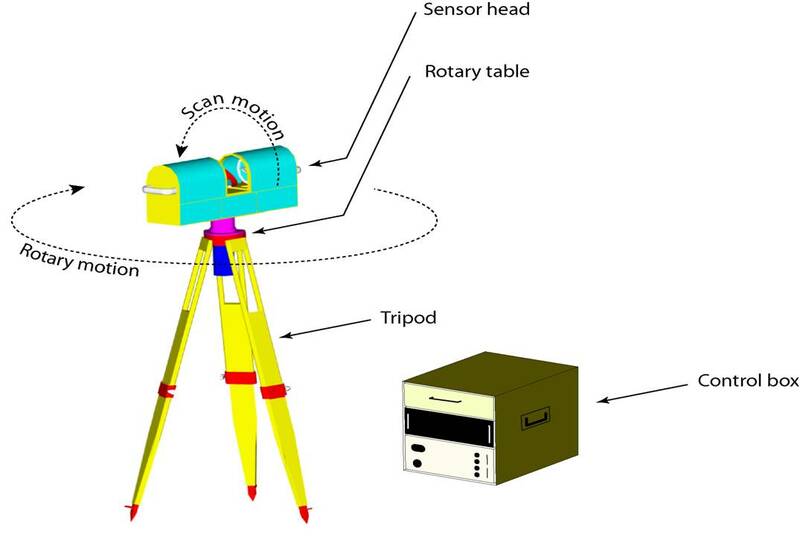 The Echidna validation instrument (EVI), built by CSIRO Australia, is based on a concept for an under-canopy, multiple-view-angle, scanning lidar, with variable beam size and waveform digitizing termed Echidna. The EVI, which is the first realization of the Echidna concept, utilizes a horizontally-positioned laser that emits pulses of near-infrared light at a wavelength of 1064 nm. The pulse is sharply peaked so that most of the energy is emitted in the middle of the pulse. The time length of the pulse, measured as the time at which the pulse is at or above half of its maximum intensity, is 14.9 ns, which corresponds to about 2.4 m in distance. Pulses are emitted at a rate of 2 kHz. The pulses are directed toward a rotating mirror that is inclined at a 45-degree angle to the beam. As the mirror rotates, the beam is directed in a vertical circle, producing a scanning motion that starts below the horizontal plane of the instrument, rises to the zenith, and then descends to below the horizontal plane on the other side of the instrument. Coupled with the motion of the mirror is the motion of the entire instrument around its vertical axis, rotating the scanning circle through 180° of azimuth. In this way, the entire upper hemisphere and a portion of the lower hemisphere of the instrument is scanned. Although the laser beam is a parallel ray only 29 mm in width, it passes through an optical assembly that causes the beam to diverge into a fixed solid angle. This expansion of the beam with distance allows the laser pulses to census the entire hemisphere. The size of the solid angle can be varied from 2–15 mrad. The rotation speeds of the mirror and the instrument on its mount are also varied so that the hemisphere can be covered slowly by many fine pulses or rapidly by fewer coarser pulses. As the light pulse passes through the forest, it may hit an object and be scattered. The light returning to the instrument is focused on a detector that measures the intensity of the light it receives as rapidly as 2 giga (GS/s) samples per second. Since the pulse is traveling at a known speed, the time between emission of the pulse and its receipt at the detector indicates the distance to the object. At 2 GS/s this equates to one sample every 7.5 cm of range from the instrument. However, because the pulse shape is consistent and stable, it is possible to estimate the range to the peak of the pulse by interpolation. The accuracy is a function of signal relative to the noise level but is normally less than half the sample spacing (i.e., 3.75 cm) with highest accuracy being in the near field where peak return signal power is high. The output of the detector is digitized electronically and stored by computer to provide a full-waveform return that records the scattering of the pulse from within a meter or less of the instrument to as much as 150 m away. Description from Yao et al. 2011. Figure 9. Echidna® ground-based lidar. Lidar pulses strike a rotating mirror at an angle of 45, providing a scan through zenith angles of 130 in a vertical circle. As the instrument rotates on its vertical axis, data from all azimuths are acquired. To test the ability of the EVI ground-based lidar to retrieve forest structural parameters, lidar scans and manual tree measurements were acquired in 2007 and 2009 at three classic New England locations: Harvard Forest, Petersham, Massachusetts; Howland Research Forest, Howland, Maine; and Bartlett Experimental Forest, Bartlett, New Hampshire. In 2008, lidar scans and manual tree measurements were acquired in the Sierra National Forest, near Clovis, California. Each plot was 100 x 100 m square (1 ha) with four 50 m x 50 m squares nested within it. True north compass readings were used to establish the grid. The compass was corrected for magnetic declination. EVI scans were made at the center point of the square and at center points of the four 50 m x 50 m squares for a total of five scans at each site (except at Howland Research Forest Plot 2 where only three scans were made) (Table 4). Manual measurements of trees were made in circular plots around the scan point of 20 m range (or 25 m at Harv_01 site). Each tree was numbered and identified to species. The distance from the center point to the tree was measured using a sonar or laser rangefinder. The azimuth of the tree from the center point was measured using a sighting compass (magnetic north; the compass used to measure the bearings was not corrected for magnetic declination). The tree’s diameter (DBH) at breast height (1.3 m) was measured using a diameter tape. All trees of DBH greater than 3 cm within 10 m of the plot center, and all trees of DBH greater than 10 cm beyond that distance were included. Also noted was the extent to which each tree would be visible to the EVI while scanning from the center point by tallying it as visible, partly occluded by intervening trunks or foliage, or fully occluded. In addition, 10 individual trees were selected (taken as the first tree at or beyond an azimuth increment of 36°) for measurements of the tree height, the height at which the crown began, and the crown diameter. The height of the tree was measured by a laser range finder, and the crown diameter was measured by a tape. Forest field biomass was calculated by allometric equations based on DBH measurements. Field LAI values were measured in two ways: hemispherical canopy photograph and LAI-2000. In this study, a Nikon Coolpix 900 camera with a 180° fisheye lens pointed toward the zenith was used at a resolution of 1,391 x 1,405. All photographs were taken before sunrise or after sunset under clear sky conditions to ensure homogeneous, shadow-free illumination of the canopy and high contrast in the blue spectral region between the canopy and the sky. To properly sample the spatial variability over the plot, 13 hemispherical photographs were taken at a spacing of 10 m inside a square or 30 m on a side centered on the point. All digital photographs were collected as highest-quality JPEG images and were analyzed using HemiView software. The LAI-2000 instrument was operated in one-sensor mode, starting and ending with reference readings that are linearly scaled with time to match undercanopy readings. Transmittance is calculated from the ratio of undercanopy to open measurements for each sky sector. LAI is then retrieved by the internal software. Under canopy samples were acquired using the same sample design as hemispherical canopy photographs. By using a"find trunks" algorithm, the investigators retrieved values of mean DBH, stem density, basal area, and above-ground woody biomass at each scan point (plot). The algorithm classifies laser returns into hard and soft targets, and works only with the hard target returns. Trunk diameter is obtained by observing the angular distance at range between the trunk’s edges. The calculation of the mean DBH of trees identified by the find trunks algorithm weights each retrieved diameter inversely by its variance, which is a function of both its size and distance. As not every tree is visible in the EVI scan because of occlusion of far trunks by near ones, the count must be adjusted for this occlusion effect. By using EVI data, the investigators used two methods to retrieve LAI from gap probability with height: single direction and multiple directions. Each plot was 100 x 100 m square (1 ha) in size, with 9 subplots in each plot (Figure 1). True north compass readings were used to establish the grid. The compass was corrected for magnetic declination. GPS records were made at the center of each field plot. EVI scans were made at the center point of the square and at the corners of the central subplot . Manual tree measurements were made in each subplot. Each tree was numbered and identified to species. The distance from the center point to the tree was measured using a sonar or laser rangefinder. The azimuth of the tree from the center point was measured using a sighting compass (magnetic north; the compass used to measure the bearings was not corrected for magnetic declination). The tree’s diameter (DBH) at breast height (1.3 m) was measured using a diameter tape. DBH and tree identification was recorded for every tree of DBH greater than 10 cm, but tree height and crown diameter were measured for a subsample (1-3) of trees in each subplot. Field LAI values were measured in three ways: hemispherical canopy photographs, TRAC, and LAI-2000. See methods for New England 2007 Campaign for details. Biomass for each stem was calculated in megagrams (Mg) using the general equations from Table 1 of Jenkins et al. 2004. Each plot was 50 m x 50 m with four 25 m x 25 m intensive subplots nested within it. For 3-D reconstruction, the exact Echidna® scan locations were surveyed to cm relative accuracy, in addition to GPS records. The locations of Echidna scan points in the plot were determined by triangulation (chain of triangles method) to centimeter accuracy. True north compass readings were used to establish the grid. The compass was corrected for magnetic declination. Nine EVI scans were made in each plot: in the four corners of each plot (NW, NE, SW, and SE), in the center (C), and at N, E, S, and W locations (Figure 2). To collect the manual tree measurements, each 50 m x 50 m plot was divided into 5 subplots (C, NW, NE, SW and SE) (Figure 3). The central subplot was a square plot, measuring 28.53 m x 28.53 m; the other subplots were isosceles right triangle plots, with 25 m right-angle side. In each subplot (C, NW, NE, SW and SE), all trees, with a diameter at breast height (DBH) equal to or larger than 10 cm, were numbered, species identified, live or dead recorded, and diameter measured. The distance from the reference point to the tree was measured using a laser rangefinder, and the bearing from the center point was determined using a sighting compass (magnetic north; the compass used to measure the bearings was not corrected for magnetic declination). The reference points were located in the center of the central subplot, and in the vertex of other subplots. Tree height, height to crown base, and crown dimensions (the longest axis and the perpendicular one) were measured on every 10th tree. The numbers of stems, with DBH smaller than 10 cm and larger or equal to 3 cm, were counted within a 10 meter distance of the reference point in each subplot (Figure 4B). Species and condition (live or dead) for the small trees was recorded. In order to register the entire plot stem map based on different reference points, some “extra” trees were selected and located to both of the central and other subplot reference points (the green points in Figure 4B). During the 2009 campaign, the investigators revisited two sites: Harvard Forest Hemlock site (HF_HH) and Howland Forest BU Shelterwood site (HOW8), where they repeated all of the ECHIDNA® scans in the same location as 2007 (Subplot_ID C, NW, SW, and SE) and added four more scans in each site in 2009 (Subplot_ID W, E, N, and S). The GPS locations may not match to each other from 2007 to 2009 due to the GPS accuracy. For the revisited sites, the 2009 GPS locations should be the most accurate. Catovsky, S., and F.A. Bazzaz. 2000. Contributions 625 of coniferous and broad-leaved species to temperate forest carbon uptake: a bottom-up approach. Canadian Journal of Remote Sensing, 627(30): 100–111. Cohen, W.B., T.K. Maiersperger, D.P. Turner, W.D. Ritts, and D. Pflugmacher. 2006. MODIS land cover and LAI collection 4 product quality across nine states in the western hemisphere. IEEE Transaction on Geosciences and Remote Sensing, 44(7): 1843-1856. Jenkins, JC, DC Chojnacky, LS Heath and RA Birdsey. 2004. Comprehensive database of diameter-based biomass regressions for North American tree species. USDA/ Forest Service GTR-319. Young HE, Ribe JH, Wainwright K (1980) Weight tables for tree and shrub species in Maine. Life Sciences and Agriculture Experiment Station, University of Maine at Orono. Miscellaneous Report 230, 84 pp. Jupp, D.L.B., and J.L. Lovell. 2007. Airborne and ground-based lidar systems for forest measurement: background and principles. CSIRO Marine and Atmospheric Research paper, 17: 151 pp. Jupp, D.L.B. D.S. Culvenor, J.L. Lovell, G.J. Newnham, A.H. Strahler, and C.E. Woodcock. 2008. Estimating forest LAI profiles and structural parameters using a ground-based laser called 'Echidna®'. Tree Physiology, 29: 171–181. Magnussen, S., P. Eggermont, and V.N. LaRiccia. 1999. Recovering Tree Heights from Airborne Laser Scanner Data. Forest Science, 45(3): 407-422. Ni-Meister, W., D.L.B. Jupp, and R. Dubayah. 2001. Modeling lidar waveforms in heterogeneous and discrete canopies. EEE Transactions on Geoscience and Remote Sensing, 39(9): 1,943-1,958. Strahler, A. H., D.L.B. Jupp, C.E. Woodcock, C.B. Schaaf, T. Yao, F. Zhao, X. Yang, J. Lovell, D. Culvenor, G. Newnham, W. Ni-Meister, and W. Boykin-Morris. 2008. 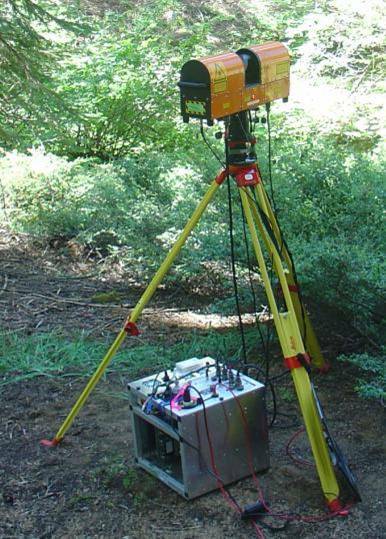 Retrieval of forest structural parameters using a ground-based lidar instrument (Echidna®). Can J. Remote Sensing, 34(Suppl. 2): S426-S440. Yang, X., T. Yao,. A.H. Strahler, C.E. Woodcock, C.B. Schaaf, R. Myneni,. J. Liu, G.J. Newnham, D.L.B. Jupp, D.S. Culvenor, J.L. Lovell, W. Ni-Meister, S. Lee, X. Li, F. Zhao, Q. Zhang, M. Schull, M. Roman, Z. Wang, and Y. Shuai. 2008. Validation Of Improved Forest Canopy Measurements From A Ground-Based Lidar Instrument (Echidna®). Abstract. IEEE International Geoscience & Remote Sensing Symposium, Boston, Massachusetts, U.S.A.